Best Season: Though Pahang can be visited throughout the year but it is better to avoid the rainy season. 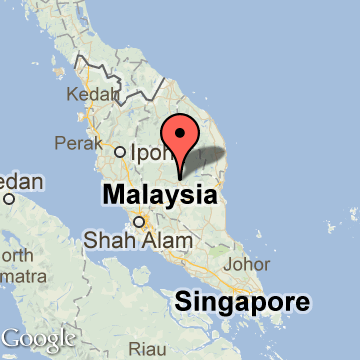 Pahang is the largest state in Peninsular Malaysia and is situated in the eastern coastal region. Two thirds of it is covered by unspoiled rain forest. Pahang has lots to offer to the tourists-famous hill resorts, palm-fringed beaches, lakes, waterfalls, and Malaysia's oldest national park Taman Negara. Located in the East Coast region of Peninsular Malaysia, Pahang is the peninsula's largest state. Currently, has a population of 1.2 million. Spanning north to south of the state, forming a natural divider between east and west Pahang is a formidable mountain range wherein lies Peninsular Malaysia's highest peak, Gunung Tahan, the inspiration of many a mountaineers in this part of the world. Pahang's climate is characteristic of the tropics - hot and humid all the year round with distinct wet and dry season that coincides with the wet seasons from the South China Sea. Kuantan, the state capital, is not only fast developing as a commercial town but is also a popular seaside resort. Pekan, the royal town is situated 45 km south of Kuantan. Evidence of habitation in Pahang dates back to the Mesolithic Era. In more modern times, the tin and gold deposits of the Tembeling River attracted the marine traders of the Srivijaya Empire. During eighth and ninth century Pahang covered most of the southern half of the Malay Peninsula. With the collapse of Srivijaya Empire around 1000 AD, Pahang was claimed first by the Siamese and then, in the late fifteenth century, by Malacca. After Malacca fell to the Portuguese in 1511, Pahang became a key part of the territorial struggles between Aceh, Johor, the Portuguese, and the Dutch. Repeated raids, invasions, and occupations devastated the state, until the decline of both Achenese and Portuguese power in the early 17th century allowed Johor to reestablish its influence. In the late eighteenth century Pahang gradually gained autonomy, and in the middle of the nineteenth century it had become an independent state. From 1858 to 1863, Pahang was fought over in a civil war between the two sons of the reigning sultan. The war ended when Wan Ahmad was proclaimed the new sultan in 1887, but his role from that point onward was largely ceremonial, as the British forced him to sign a treaty bringing the country under control of a British Resident. In 1896, Pahang joined Selangor, Perak, and Negeri Sembilan in the Federated Malay States. This evolved into the Federation of Malaya in 1948 and later on into the Federation of Malaysia in 1963. Kuantan, the state capital of Pahang, is easily accessible. By air, the state is accessible from Kuala Lumpur and Singapore. By road, one can travel from Kuala Lumpur, Singapore and Kota Bharu. By train, Pahang is accessible through Mentakab and Kuala Lipis from Kuala Lumpur and Kota Bharu.